To calculate the amount of drywall you'll need, enter your specs in the calculator below. Make sure to measure all room sections you plan to drywall. Afterwards, connect with drywall pros in your town. Tip: Our calculator uses standard door sizes of 80 inches by a minimum of 32 inches. *Area of all windows and doors is subtracted from totals. 10% allowance for waste included. This is an estimate. Get accurate drywall quotes. It's free! DIY Or Hire A Drywall Contractor? Drywall, also known as sheetrock, is an essential building component of most homes. Separating you and those ugly frames or insulation behind, drywall is an expensive material that is easy to work with. Of course, determining how much drywall you need is the first step. Enter our drywall calculator. To use the sheetrock calculator above, all you need is a tape measure. Our custom drywall material estimator will take care of the rest. Off the bat, know that our calculator only measures one room. If you need to determine how much drywall you need for your 2,000 sq ft house, you’ll have to measure room by room. First, measure the room perimeter. This is the distance around the room, in feet. Measure the width of each wall and then add all totals together. Enter your room perimeter into the sheetrock calc above. Next, measure the height of the walls, or distance from the wall to the floor, in feet. If you have a sloping ceiling, use the greatest height in the room. Enter value into calculator. Next, and you may need a ladder for this, is the ceiling area. To measure the area of a square or rectangular room, you have to multiple the width by the length. Most of the time, you can just measure the floor and apply those numbers as the ceiling specs. Enter this number into the drywall calculator. If your ceiling is not a square or rectangle, but a triangle, the area is the base multiplied by the height, then divided by two. Now, we have to incorporate the areas of the room where drywall is not required. Usually, that entails the doors and windows. First, enter how many doors. Then, if there are windows, enter the total. To ensure you get the most accurate drywall sheet estimate, measure the height and width of the windows and enter into the calculator. Finally, select from the four most common drywall sheet sizes and hit calculate. Voila! The drywall estimator should tell you exactly how many drywall sheets you need for your upcoming project. If you need assistance along the way, ImproveNet can help you find reliable drywall contractors near you. If your room is not a square or rectangle, break it up into smaller sections. Measure walls and ceilings in each section and then add together. Sloping walls all together form a triangular area. Therefore, you can calculate the triangular space by using the area equation: length of the wall at the base of the triangle multiplied by its height and divided by 2. See image above for more details. If measuring by hand, always add at least 10% to the drywall sheets required. There will be waste. If measuring by hand, you must know the size of your desired sheetrock. Once you do, determine the square footage of one sheet. For example, if you’re using 4′ x 10′ sheets, the total square footage of one sheet is 40sf. Once you determine surface area of the entire room, or how much drywall is needed, divide that number by 40. This is the number of drywall sheets required. Despite the drywall sizes listed above, drywall sheet lengths can go up to 16’. The most common drywall size is 4’ x 8’. Anything bigger is very difficult to carry and install on your own. By now, you should know exactly what drywall is, but for those just getting into sheetrock DIY, it helps to know your materials. Drywall boards are used for interior walls and ceilings. Unlike plaster, the other dominant material for walls and ceilings, installing drywall is quick. For plaster, you have to wait for it to dry, thus increasing your installation time. Despite quicker installation, sheetrock can suffer from water damage and corrosion. As such, after a flood or any wall damage, homeowners have to replace their existing drywall. Additionally, since it’s not waster resistant, standard drywall is not often used in bathrooms or kitchens. How Much are Other Drywall Materials? Drywall Screws: These specialty screws are usually sold by the pound, which accounts for approximately 500sf of drywall. Drywall screws cost $6 per pound. Tape: You need tape to cover the joints between the drywall sheets. Luckily, tape is inexpensive and costs approximately $4.50 for a 150-foot roll. Joint Compound: You need a flat surface to paint. Joint compound is used to smooth over any blemishes from drywall tape, fasteners and joints. It costs an average of $15 for a 5-gallon container of premixed compound. Most drywall contractors calculate how much joint compound they need by taking the square footage of the room and dividing it by 7.25. Overall, if you DIY, most homeowners spend between $0.30 and $0.35 per square foot for the drywall and other materials. We’ve touch on drywall sizes already, but before you purchase any sheetrock, you should understand all your options. As you can see in our drywall calculator above, most sheets have a width of 4’. More often than not, you won’t see a different width. However, if you ask the home improvement store, they should have sheetrock sheets that are 2’, or they can special order drywall that is wider than 4’. The most common drywall size is 4’ x 8’. Therefore, the most common length is 8’. Eight feet is short enough for most homeowners to handle, but long enough to ensure you’re not taking weeks to install new drywall. Nonetheless, for longer walls or taller ceilings, some homeowners get some help and install 4’ x 12’ or 4’ x 16’ drywall sheets. 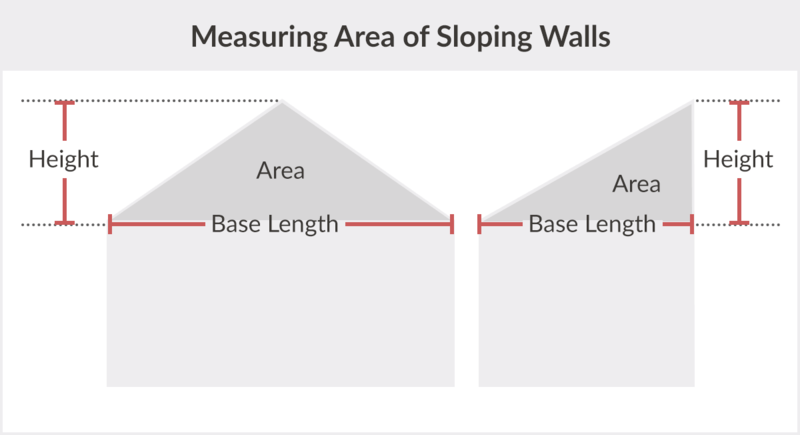 Beyond length and width, you have to consider the depth of your drywall sheets. Just like the size, drywall sheets come in a few different thicknesses. The most common sheetrock thickness is a 1/2”. They’re easy to carry and if you pay a little extra, you can buy lighter 1/2” drywall for easier installation. The two other drywall thicknesses are 1/4” and 5/8”. Quarter inch drywall is mainly used as a double surface and 5/8” drywall is primarily used on ceilings. The thicker drywall is often used if the home has experienced sagging or if you’re installing a coffered ceiling, tin ceiling tiles or any textured ceiling above the drywall. Drywall boards come in different types. First, there’s regular whiteboard, which comes in a thickness between 1/4” and 3/4”. Fire-resistant drywall, also known as Type X, has different layers and thicknesses, which increases the resistance of the walls to fire. Greenboard is another drywall. Expectedly, it has green-colored paper that deflects water and is commonly used in bathrooms or laundry areas that have a lot of moisture. Blueboard is called such because of its blue paper, which resists both water and mold. Then there’s cement board, soundboard, soundproof, mold-resistant and enviroboard—just to name a few of the many others available. Depending on the use of the room you plan to drywall and your budget, you can pick the best drywall for your project. Discuss your plans with a specialist so you can purchase the most appropriate for your budget and use. Installing drywall is not a difficult project, but it is demanding. Unless you use all 2’ x 2’ drywall sheets (which we don’t recommend as it will get expensive), lifting all these drywall sheets, screwing them in and installing a drywall ceiling is no small task. However, unless you’re building a new house, chances are, you’re replacing drywall in a room or two. For smaller projects like this, some homeowners give it a go and install drywall without a professional. If you’ve decided to DIY, you’ve come to the right place. Below are the basic steps to installing drywall in a new home. For the full step-by-step process, please see DIY Tips For How To Install Drywall. Make sure you have all tools and materials. Mark the centerline and lines along the framing. Cut or break the ceiling drywall sheet to length. Use a lift or a few friends to hold ceiling drywall in place as you screw it in. Install all ceiling drywall, working around lights and fixtures. Install wall drywall, working around the windows, doors and outlets. The average drywall sheet weighs more than 50 lbs. There’s no shame in getting help for your drywall installation or replacement project. Fortunately, ImproveNet makes it easy to fine reliable drywall contractors in your city.